Arguing from Scripture and history, Dr. Boyd makes a compelling case that whenever the church gets too close to any political or national ideology, it is disastrous for the church and harmful to society. Dr. Boyd contends that the American Evangelical Church has allowed itself to be co-opted by the political right (and some by the political left), and exposes how this is harming the church's unique calling to build the kingdom of God. 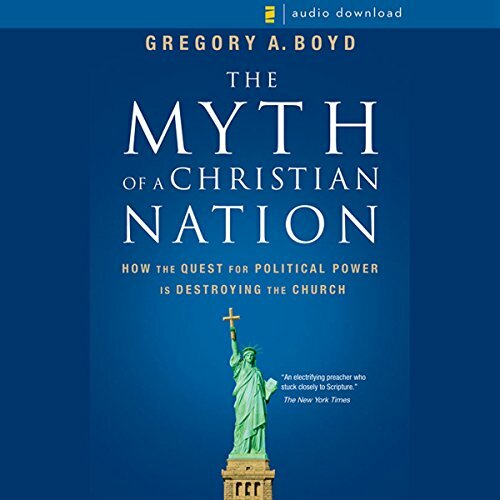 In the course of his argument, Dr. Boyd challenges some of the most deeply held convictions of evangelical Christians in America � for example, that America is, or ever was, "a Christian nation" or that Christians ought to be trying to "take America back for God". Where does Myth of a Christian Nation rank among all the audiobooks you’ve listened to so far? What was one of the most memorable moments of Myth of a Christian Nation? How he challenges thoughts on abortion and homosexuality. What does Richard Allen bring to the story that you wouldn’t experience if you just read the book? Actually he was a little boring to listen to but the material he read was great. This book was full of truth, and really challenging. If you''re looking for a book that is going to cheer on the American faith you already have then this ain't the book. However, if you truly want to challenge your biblical faith this book will do that. Great book, great perspective! My American Church History prof in seminary recommended that I read this after I raised a series of questions after class. I found too many holes in official accounts, including books on his syllabus. Here my questions were answered. If you're uncomfortable with how Christianity has overlapped with nationalism, this could be helpful. I think it would have been even more powerful if Dr. Boyd would have narrated his book. Thoughtful approach to a christian response to nationalism. Are we citizens of this world? He argues we are citizens of the Kingdom of God. A timely message for the church in North America. A must read for Evangelicals. Well written and powerful. Pastor Boyd is spot on! Americans need to read this book, reflect and humbly pray for authentic christianity to overcome the evil inspired distraction ,confusion and sin that exists throughout their culture and society. This is one very long sermon showing why according to Christian scriptures the current christian right politics is in his oppinion is not correct christianity. This book clearly explains the inordinately powerful bond between the Evangelical church in the US and conservative ideology. The boundary between Christianity and conservatism is blurred to many believers across the country. This book shows the clear distinction between the two. It also explains the terrible hindrance to the spread of the Word of salvation that this bond has been. Not an easy listen at first but it is good material on how to approach politics as a Christian. What Gregory R. Boyd proposes is a Christianity devoid of nationalistic ties. Living mirrored by Christ, not by "my country/church/beliefs is/are more godly than yours." My only complaint was Richard Allen's narration, though well done and articulate, was a bit dull. Conservatives need to hear this perspective, they need to have a fresh look at the scriptures and prioritise loyalty there before country.